A friend reminded me yesterday that Valentine's Day is coming up. My reply was something like: "Whoa, thanks for letting me know! I'm so clueless about normal-people life patterns, since all I do is follow fish and marine life patterns." No joke. 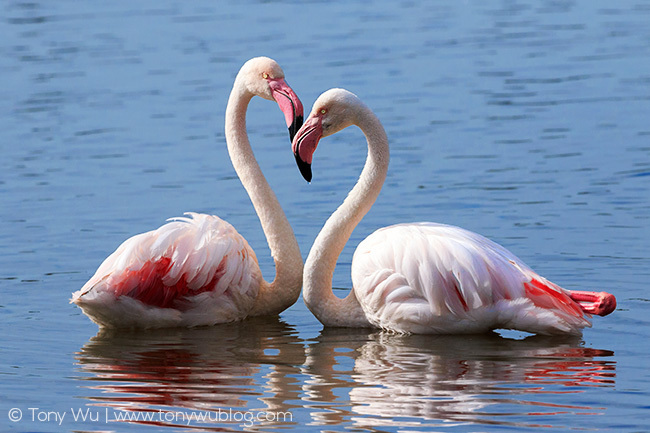 But I got on the case and prepped this image of a pair of greater flamingos (Phoenicopterus roseus) for Valentine's Day. The beautiful birds came together in perfect light for just a moment to form a heart shape between them. Adorable, no? Order by 7 February to have the print delivered within the USA. I'm not sure about the timing outside of the US, as shipping times vary.